I can provide DWG file, 2D or 3D model of your HDB flat for only $40! And not just HDB floor plans. I can also design condo floor plans, house plans, etc. Contact me for anything that can be drafted in AutoCAD! I am writing this page in 2013 after being hired by a Malaysian architect to draw 5 HDB whole block floor plan in AutoCAD, for analysis of space efficiency. Later, a Singaporean asked me to draw his own HDB flat and suggest furniture layout. Another one asked if I have certain HDB flat in DWG format, I replied “I can draw it now in AutoCAD” but he said “Thanks anyway” and quit. Beside this, watching website traffic I see many searches like “hdb 3-room new generation dwg file“, and most people do not click About Me page to see that I am also AutoCAD designer and I could offer DWG files. So I made this page to show… some of the HDB flats designed so far. You can give me floor plan of your flat, you can choose a floor plan from the page with 100 typical HDB Floor Plans (but beware of possible differences between your flat and the typical floor plans posted here), or give me your block number and I may have or not the exact floor plan in my collection of PDF floor plans collected from Sale of Balance Flats. There is not mandatory to provide a floor plan with dimensions. I can also use a block plan from BTO brochures, put it in AutoCAD, draw a polyline over 4-room flat and scale it until it reach the floor area of 90 sqm. There will be a small error margin, but it will be no problem if you use DWG file for presentation only and not for calculation of interior design. You can choose the detail level (2D or 3D, add furniture, dimensions, or leave only walls) and how to give you (DWG, DXF, PDF, etc). Price formula: $20 + $20 for each flat floor plan or + $40 for each block floor plan. This formula is intended to provide discount for people who need more than one floor plan. With other words, $40 for first flat and $20 for additional ones, $60 for first block and $40 for additional ones. 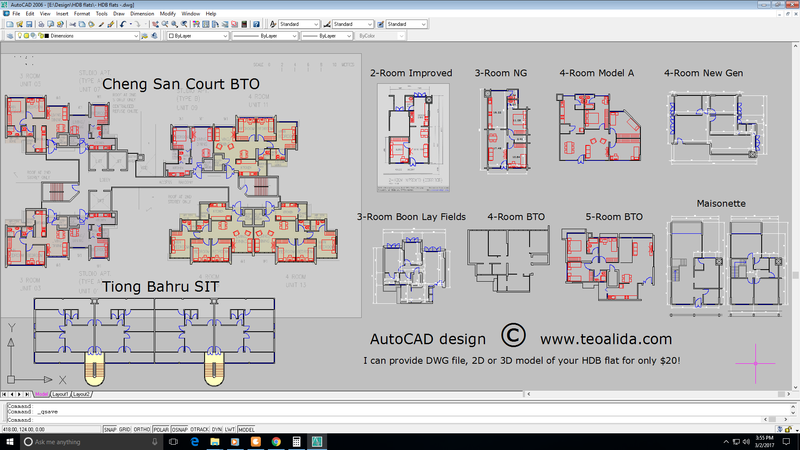 Drafting 2D over HDB floor plan takes about 1 hour if I am not busy with another project. 3D-ing a 2D plan takes 10 minutes. I treat each customer individually and give you a personalized DWG file. There is a chance that you want DWG of same flat type as a previous customer, this save some time, but the drawing may have only walls in 2D and 3D because this is what the previous customer wanted, while you want 2D only but with dimensions and furniture, so I cannot sell “as it is”, instead I will remake drawing “as you want”. Yes I can design landed houses too… do you have a floor plan that need to be converted to DWG (and it include dimensions or I need to guess dimensions), or do you have a piece of land and need architectural drawings to build the house? Talked via email. This person have a house in Indonesia, don’t have floorplan and wants me to travel to Batam to take measurements and suggest a layout for second floor… sorry, can’t do this! who actually understands what they are talking about onn the web. Yoou certainly understand how to bring an issue to light and make it important. More people nred to read this and understand this side of the story. Como agregar Talentos à Empresa. São Paulo: Atlas, 1995.